The Oceanside man accused of disturbing the peace by trashing his former home will spend some more time in jail. 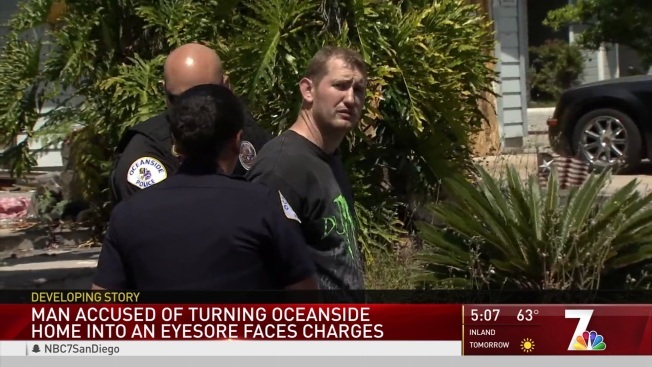 Christopher Fore was arrested late last week when Oceanside Police tried to serve him with an abatement warrant. That warrant would have barred him from continuing to live in the house on Chauncey Road, which is now declared uninhabitable. When Police searched Fore they found ammunition and methamphetamine in his pants pockets, so they took him to jail. Fore pleaded not guilty Tuesday to the charges and asked the judge to reconsider the $100,000 bail set the day of his arrest. Deputy San Diego Public Defender William Matthews argued the bail amount was excessive considering the charges weren’t that serious. Judge James Simmons, Jr. disagreed. He noted that police had been called to the home Fore occupied more than 80 times and that during one of those visits Fore was charged with resisting arrest and theft of public utilities. Code Enforcement officers from the City of Oceanside red-tagged the house in February, after declaring it unfit for human habitation. The utilities were turned off and the house was boarded up, but neighbors and police say it didn’t take long before Fore moved back in and continued to destroy the place. Police said their hands were tied because what Fore was doing was a civil matter, not criminal. Neighbors claim that Christopher Fore was smashing out walls and windows, sometimes tossing debris into their yards. The situation changed after the Oceanside City Attorney asked a judge to sign a second abatement warrant, which police executd Friday. Oceanside Police and Code Enforcement crews boarded up and cleaned up the property Friday afternoon while neighbors stopped by to say thank you. Simmons said Fore is a danger to the community and kept his bail at $100,000. If Fore does bail out, he may find police waiting for him if he returns to the property. The City of Oceanside plans to file a temporary restraining order to keep Fore off the property. That order will likely be in effect before Fore’s next hearing on April 24.